Alt text: The Hertzsprung-Russell diagram is located in its own lower right corner, unless you're viewing it on an unusually big screen. I couldn't find this in the list. It must be there, musn't it? I mean explainxkcd already has an entry... And I don't get the title text at all. Last edited by gmalivuk on Wed Jun 20, 2018 4:59 pm UTC, edited 1 time in total. Disappointed that a few things didn't make the chart. So, the joke is that these diagrams are usually for stars, but here other things are being included? I don't get the title text at all. The image itself has a luminosity and effective temperature if you're viewing it on a computer monitor. That monitor itself (or more precisely the portion of that monitor displaying the image) would be at the lower right corner of this diagram. Unless you had a particularly large monitor, in which case the luminosity would be higher. Where on this diagram would you place Dr Manhattan? da Doctah wrote: Where on this diagram would you place Dr Manhattan? Just below Dr. Bronx . I understand everything on here except for whales and astronomers. How do they emit luminosity? Also bioluminescent plankton and smartphones. zjxs wrote: I understand everything on here except for whales and astronomers. How do they emit luminosity? Sableagle wrote: Also bioluminescent plankton and smartphones. Drat, I see my idea of making a fortune by selling smartphones to whales has already been though of. Last edited by Cousj001 on Wed Jun 20, 2018 8:42 pm UTC, edited 2 times in total. So what he's really saying is "astronomers aren't very bright". While they are slightly hotter than a blue whale, they just don't shine. ... and there will be cake. Speaking of Body Heat, Kathleen Turner is about 10000 K.
there's an error on there, right? the arrow in the x-axis should be pointing to the left. 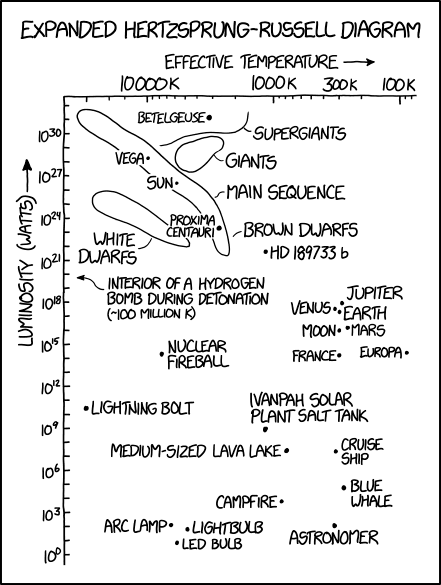 NotAllThere wrote: Alt text: The Hertzsprung-Russell diagram is located in its own lower right corner, unless you're viewing it on an unusually big screen. This is, of course, known as Hertzsprung-Russell's Paradox. There's an empty space between the cooler Supergiants and the cooler main sequence stars. Why's there an empty space? Surely an LED bulb has a lower effective temperature than a normal (incandescent) light bulb. They have about the same surface area, but an LED bulb emits less total EM radiation. LEDs only look "hot" because their spectrum is so different to that of a black body. Sandor wrote: Surely an LED bulb has a lower effective temperature than a normal (incandescent) light bulb. They have about the same surface area, but an LED bulb emits less total EM radiation. LEDs only look "hot" because their spectrum is so different to that of a black body. Not clear what you mean by "effective temperature." and don't call me Shirley. the temperature of an object calculated from the radiation it emits, assuming black-body behaviour. yeah, i wondered about the definition of this, too. effective temp is not actual temp, as i (and Sandor it seems) would have assumed, but the effect measured in blackbody temp it has based on its radiation. so a 6000K LED has a high effective temp although it probably isn't actually warmer than 300K. why is a Blue Whale more luminous than an astronomer? And light switches would be far more fiddly. I think that's the most important point. They really couldn't flip a teeny light switch with their flippers. They might be able to swipe it with their tail, but that would still be down to a huge fluke. When looking at this you really have to consider surface areas. Which is why I was at first a little confused as to the positioning of France. But had to remember the scale of the Luminosity axis. That's why France-Europa-Moon-Earth-Venus-Jupiter seems a little odd at first. itaibn wrote: Also, I'm getting tired of digs on the intelligence of astronomers. The only digs I've seen have been around archaeologists! Why is Great A'Tuin not on here? Muswell wrote: Why is Great A'Tuin not on here? Heck, where's Eärendil with his silmaril aboard Vingilótë? 'Not sure where an elven spaceship falls thermally, but the silmarils were widely known for their luminosity. He's a little busy helping the Free Peoples reclaim mordor at the moment, making his luminosity extremely hard to measure. We know from examining the stats of the gear people are using there that the luminosity of Eärendil is quantum. We just don't have a way of calculating the total number of those quanta. If two Champions on two different world servers each use a cuirass with 10 Light of Eärendil, are they between them wearing 20, or are they wearing the same 10 in superposition, with those 10 existing on one world or the other, depending to which server you connect to check? Sableagle wrote: There's an empty space between the cooler Supergiants and the cooler main sequence stars. Why's there an empty space? Because a cool star on the main sequence is also a very small star and vice versa (red dwarfs). A supergiant, as the name implies, is quite large. With both being at the same blackbody temperature, that size difference translates to a huge area difference and a huge luminosity difference. Two whale-related puns in one week? You've b[al]een told. It seems strange to me to see someone calling incandescent bulbs normal. The sale of incandescent bulbs was banned here in Australia almost a decade ago. At least, the traditional incandescent filament bulbs were banned, you can still get some halogen type bulbs. Most domestic light bulbs here are now compact fluorescents, or LEDs. The old incandescent traffic lights were replaced by LEDs shortly before the ban took effect. I guess we'll be getting LED street lights at some stage, currently they're some form of metal halide lamp. miturian wrote: there's an error on there, right? the arrow in the x-axis should be pointing to the left. Hello fellow 1-poster. Yep. I came here to point out the same thing. I was at first confused about why the hydrogen bomb was on the far left at 100e6K. The short answer is "tradition". The H-R diagram was originally absolute magnitude against spectral class, with spectral classes going O,B,A,F,G,K,M,L,T with decreasing temperature, so you get a downwards slope. And when the scale got refined to use temperature rather than spectral classes, it stayed the "wrong" way round.